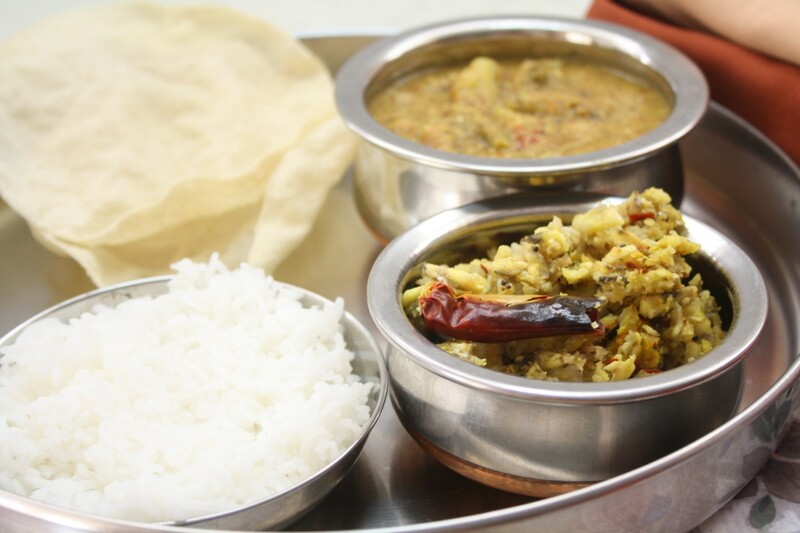 For the final day of Regional cuisine, from Tamil Nadu, I have a favorite dry saute, that I have always enjoyed, yet made it myself for the first time. This Vazhakkai Podimas is famous in the circle it gets done and I have been in the recieving end many times. To think I have never made it myself, was quite surprising. So I felt I ought to rectify it soon. When I served it with the Pavakkai Pitlai, it was a perfect match. Hubby dear even said he likes it this way much better than the regular poriyal method. One can make it quite spicy or dal rich by adding channa dal. I kept it quite simple as I felt the pitlai was rich enough. wash and chop the plantain into half. Pressure cook with enough water. Once the pressure falls, peel off the skin. Grate the plantain or mash. Heat a non stick pan with oil. Temper with mustard, Urad Dal, curry leaves, hing and slit red chilies. Saute well. 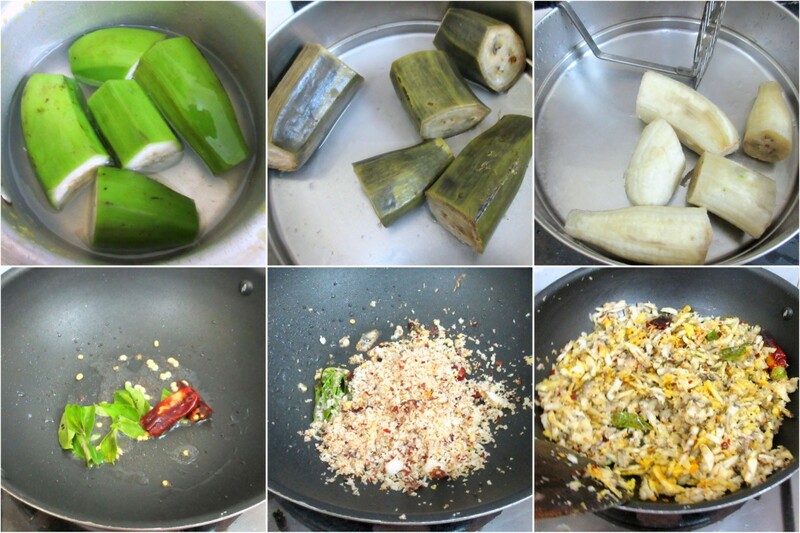 Grind coconut with red chilies to a smooth powder. Add this to the pan. Saute well till the coconut is cooked well. This takes about 2 to 3 mins. Now add the cooked plantain. Add salt, turmeric powder and sprinkle some water. Cover with lid and cook for 5 to 7 mins. 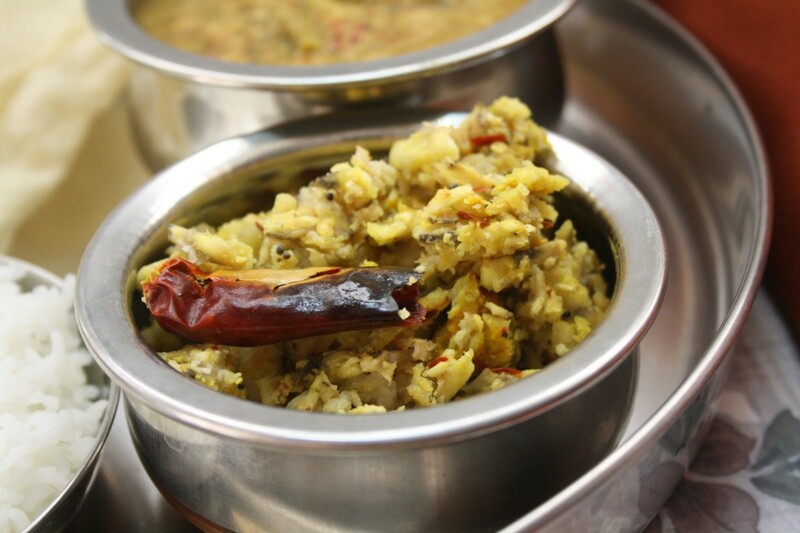 The coconut can be roasted along with channa dal and ground. That will make it even more rich. Even I do podimas but little differently. I use grated coconut as we do for simple poriyal. 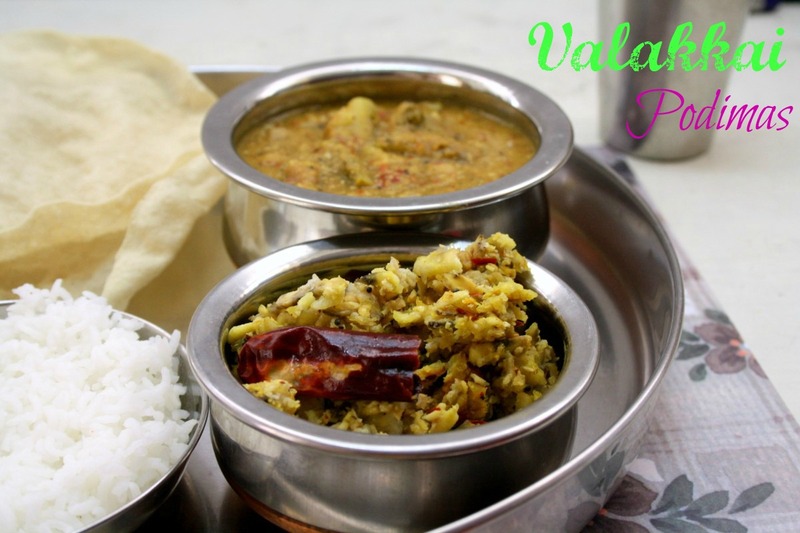 This version looks very nice..
Love vazhakkai podimas with rasam rice. 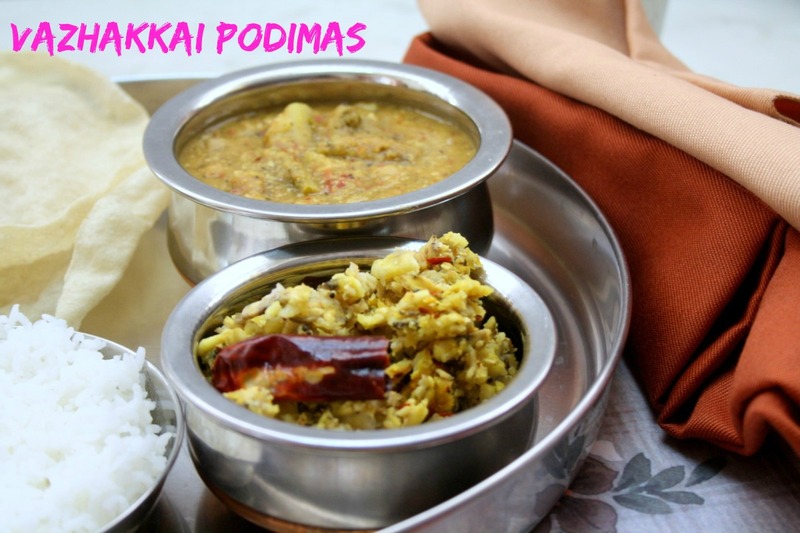 Nothing can beat this combo, dont make me hungry like this..
love the podimas when the vazhakkai is grated as you have done, valli ! That's a new one for me from your treasure Valli ! Interesting ! Delicious plantain curry. Looks very easy to make. Your photos are very pretty! This looks tasty! Different way to have vazhaikai. Thanks for step by step pics. I love making podimas at times out of raw banana and potatoes. It is a pleasant change from the routine vazhakkai fry. We do make podimas a lot but in a different way.This version sounds new to me,looks tempting. My MIL's podimas taste really good. This just reminded me of hers! very interesting curry.Looks like a great side for roti. Love it. This has become one of my favorite ways of cooking plantain recently.